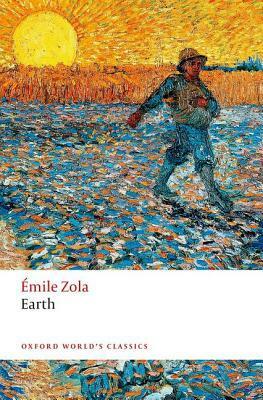 This entry was posted in 1887, Émile Zola, Commentary, English, Lisa Hill (ANZ LitLovers), Nelson, Brian, No 18 and tagged Émile Zola, Earth (La Terre). I’m a long long way behind you in this series but it’s great to know he keeps up the quality and there is such a great to know there is this gem awaiting me. The way he portrays women as commodities here seems to echo Germinal in many ways. Yes, I’d like to know more about Zola’s attitudes to women: sometimes I think he is a bit too accepting of violence against them, and other times I think he’s exposing the violence in the way that Dickens was exposing poverty. I love your review! I’m trying to get into the series, but I started reading it in no order (it’s hard to find his books here where I live, and I have to revolve around second-hand bookstores, so I read them as I found them). I read La Terre last year and, I don’t know, I can’t find words to describe it, I felt like I wanted to read it without end, forever, it was such a pleasure! Hello Fiorella, how nice to meet another enthusiast for Zola! I was like you, Fiorella, and read the books as I could find them. There are a few cases though that stand out. Doctor Pascal should be last as it contains spoilers for all the other books. Although if you’re like me, you’ll forget a lot of it as time goes by. Ideally, Pot Bouille should be read before Au Bonheur des Dames. In Pot Bouille, Octave Mouret is rather carefree; he’s out to have a good time and make his way in the world. He is also featured in Au Bonheur which commences just slightly later in time. Last year I was lucky enough to get quite a number of the books, which are now waiting in the to-read pile. I know they work pretty well as stand alone books, but, at least with these, I’m going to read them in order. I’ve been looking for The Ladies Paradise everywhere (specially after watching BBC’s The Paradise) here, but I could only find a French edition, a language I’m sadly not very good at (yet). It was fun, though, while reading Pot Bouille, realizing who Octave was. It was a very entertaining story! It’s available in a BBC linked edition of the Oxford Classics. It costs £1.39 from Amazon.co.uk. Where are you based, Fiorella? Can you access online stores like the Book Depository (free delivery) and Amazon (which has some second-hand copies)? We are very lucky here in Australia, we have Brotherhood Books, which is a charity selling second-hand books. I’ve been able to get quite a few out-of-print treasures from them, and the books have been very cheap especially if I buy a whole lot and once and get a discount on delivery. (But they wouldn’t be cheap if you added international postage, I’m sure). Yes, online is a last resort for me too. It’s very important to support our local bookstores. Besides, I find I enjoy the hunt and the feeling of satisfaction that I get when I finally get the book! Ive read a book about Zola’s life, it was worth every sentence. It was written by Armand Lanoux and it’s called Bonjour Monsieur Zola. I dont know if it came out in English, i read it in Hungarian, but if you can i definitely recommend to read it. I started to make notes for myself that i wanted to remember from it, i soon realized, its almost something on every page… You not just learn about his life, but also about the circumstances his works were created. Magic. Hello Savanah, I’ve had a bit of a hunt around, and I don’t think this one is available in English. Maybe you could write a review for us? I have an edition in English published in 1955, by Stales Press. I don’t think it’s been reprinted since. You might find it on eBay, Abebooks or so where like that. Hi Lisa. It’s a shame they dont re-print these treasures anymore. 😦 I also could buy only a second hand old version from it in Hungarian. I’m a little more than half way, reading the Penguin translation. It’s hard not to try to compare this to Germinal. I do like the part where I’m at now in the book with old Fouan getting shuffled back and forth living with Hyacinthe. I was hoping for more farming stuff in the beginning and less the provincial life overview. I have the french and was curious about the dialogue of the characters, etc. I think I read a criticism by a contemporary that it was a little too polished to be real. But Zola is fantastic writer. Hello Dan, and welcome:) It’s always nice to meet up with someone who likes Zola! La Terre is one of my favourites, and for the reason you’ve alluded to: the authenticity of the family life. Those squabbles over the land, and the way they treat old Fouan, it’s as unforgettable as King Lear IMO. A masterpiece indeed. This is one hell of a novel. I’d thought Germinal was excellent, but I found myself grabbed by this one even more. There are some terrific characters, La Cognette is a mini-Nana, the flatulent rake Hyacinthe, Fouan the ex-patriarch. Jean the protagonist sometimes seems a bit flat by comparison. Once again money (and its absence) has a huge influence on how the characters fare. And a relatively small amount can make the difference from a fairly comfortable existence and abject poverty. Buteau is a fairly big man in Rognes, wealthy enough to hire Palmyre’s labour (and work her to death), but his family is so poor that a gift of used linen from the Charles’ “confectionery shop” is a cause for celebration. La Grande is proverbially wealthy, yet she goes to other people’s houses every night to save the cost of a candle. Her abandonment of her grandchildren (Palmyre and Hilarion) is horrific, and I wanted to see her die horribly so we could see what destruction her famous would wreak amongst the family. Even Hardequin, with his big farm is only short way from ruin, and with the American grain set to flood the market that looks very likely. There is so much more going on in this one, I can’t even begin to do it justice. Oh, Conrad, what you say is so true. It’s impossible to do Zola justice, *chuckle* I don’t know why I try! Well I’m glad you do, I still haven’t convinced anyone I know to actually read any of Zola’s novels, so here’s the only place I can discuss them! Ah well, that’s true in my real life as well. I don’t know many f2f readers who read like I do, and of course, we don’t necessarily share the same taste. This is where the web is just so brilliant, we can always find someone somewhere who likes the same books!